Financial markets continued their ascent last month, a rising tide of investor optimism lifting all risk asset boats. Investors appeared to shrug off recessionary concerns, focusing instead on the positives of easy monetary policy, low inflation, slowing but still growing corporate earnings, and signs of progress regarding China-U.S. trade talks. On the economic front, the modest spending increase detailed in Canada’s 2019 federal budget does little to alter the softening outlook for the Canadian economy. The onus is therefore on the Bank of Canada to support growth. The U.S. economy slowed last month as well, joining the rest of the world in a soft patch. A likely explanation for the deceleration is that country-specific issues have begun weighing on activity in the world’s top regions – the U.S., China and Europe. This contrasts with the crisis of 2008/09, where the decline was not due to a combination of national factors, but rather a single global shock. This lends credence to the many market pundits who forecast a steady cyclical slowdown ahead, rather than a steep recession or crash. March’s fixed income news was dominated by central bank announcements. As widely anticipated, the U.S. Federal Reserve left interest rates unchanged, acknowledging low inflation and a slowing economy after a strong 2018, particularly for household spending and business investment. Similarly, the Bank of Canada dropped its pledge to continue raising rates to a neutral range, recognizing that the slowdown in global activity no longer justifies higher interest rates in the near term. Across the pond, the European Central Bank surprised markets with a new round of stimulative financing in the form of very low interest rate loans to eurozone banks. For now, higher interest rates are off the table for most major economies. Central banks are betting that either inflation is not a risk, or that it is a risk worth taking if it lowers the odds of recession and/or deflation. Last month’s inversion of the U.S. yield curve had some investors concerned that a recession was looming, while others warned against reading too much into the inversion. We think the answer lies somewhere in between, as the exact timing of a recession is notoriously difficult to predict. While an inverted yield curve is a typical event in the latter stages of an economic cycle, the time lag between inversion and recession is highly variable, ranging as short as one year and as long as three years over the last four decades. The FTSE TMX Canada Bond universe returned 2.4% in March, and 3.9% for the first quarter of 2019. Supported by the recently dovish tone from central banks, equity markets showed little sign of reversing their upward march last month. The Canadian stock market returned 1.0% in March and a remarkable 13.3% year-to-date, with every sector of the TSX in positive territory for the first quarter. The U.S. stock market advanced 3.4% this month and 11.2% for Q1. International markets (ex-North America) and Emerging Markets gained 2.2% and 2.3% this month, as well as 7.7% and 7.5% over the quarter. The question investors continue to face is where will markets go from here amid brewing economic concerns. 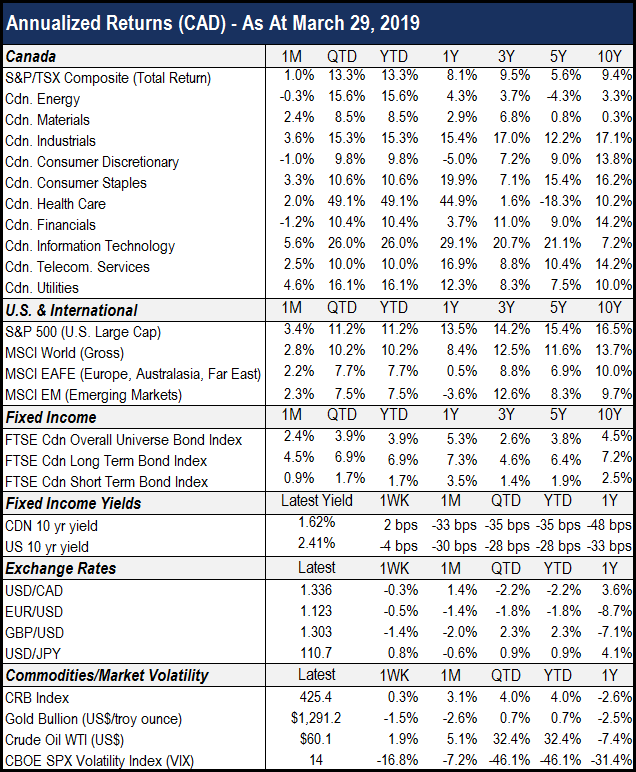 Will the rally in risk assets persist? Is a downturn closer than we think? Will slower growth continue indefinitely until we reach the soft landing that central banks project?While recession fears are real, there is no clear sign that one is imminent. Several market risks continue to persist, with downward revisions to corporate earnings at the helm. Looking ahead, markets are likely to witness periods of elevated volatility until clearer signs of improving economic growth materialize.